Being an elf is not a job for the weak. For weeks now, Terry has been in the midst of designing holiday gift baskets for an array of clients. Once again we are designing a whole holiday catalog for Universal Studios, a variety of baskets in all shapes, sizes and price points. 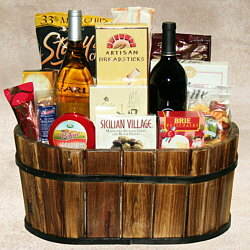 The wine gift basket pictured here features two Universal branded wines and great foods in a striking basket made from barrel staves. 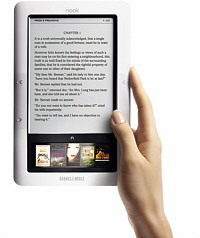 Barnes & Nobles has just brought us an exciting opportunity to package their Nook electronic reader for the corporate market. Ususally when we design a corporate gift basket such as this it’s for promotional use by the company we’re designing for. But placing the incredibly user friendly Nook, with its various accoutrements, in an attractive container with coffee, tea, possibly wine and such makes a fantastic gift basket good for the holidays, a birthday or a get well gift basket. We look forward to offering this to our clients this holiday season. There are other projects afoot as well, including one for Heineken that will involve clear ice buckets and fake ice… Exciting! What can we design for you?